Create custom-looking displays at a more effective cost. The Luxe system features patented round uprights, providing the flexibility to build the unit in four different directions. Compatible with thousands of standard parts, Luxe offers virtually endless configuration possibilities. Put method back into the madness of checkout lines! Madix’s Luxe Queuing Solution helps retailers boost sales by reducing wait time in the checkout area, improving customer satisfaction and strengthening brand loyalty. Our Luxe Queuing Solution feeds one line of customers to multiple registers in an orderly and efficient manner, minimizing customer frustration. And with the variety of configurations available, retailers have the flexibility to promote more impulse merchandise and services at a consistent exposure level. 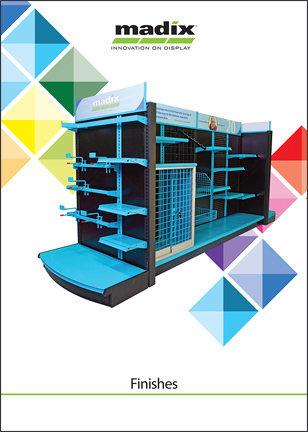 Our Luxe Queuing Solution offers almost all standard Madix shelves and accessories. Versatile pieces can be combined to form several different displays, including tables, freestanding units, and wall anchored gondolas. Download the new Luxe catalog for components and accessories. DO NOT use casters on L- Uprights unless it is supported on the rear by another Luxe fixture. Contact Sales Consultant regarding application. Includes a locking plunger bolt on both ends of the Connector Rail if locking option selected. Nominal width of 18" (457 mm) available, largest depth of adjacent shelves is 8" (203 mm). No Luxe 45° Corner Shelf (LUQSUS45-10) available for 18" (457 mm) corner. Maximum post height is 60". If you require taller posts, please contact your Madix sales representative. Accessories must not exceed 6" (152 mm) deep. Do not exceed 142 lbs per section per side when using 6" accessories. If a higher weight capacity more than 142 lbs per section and deeper than 6" accessories are required please contact your Madix Sales Representative. Maximum post height of 60" (1524 mm). If taller posts are required please call your Madix Sales Representative. 5 1/2"H x 3"W x 3" D, retainer extends 7 1/2"